Sonoma’s FourTrack was one of the first multi-track recording apps for the iPhone and does a great job of mimicking the original concept, despite its limitations. That means, for example, you can’t erase a track that’s gone wrong – you can only record over it or use the navigation wheel to position the recording in the right spot, then drop in to record the ‘fix’ and then drop out again. Having recorded on all four tracks, you can also ‘bounce’ them down to the first two tracks, then record again on to tracks three and four. 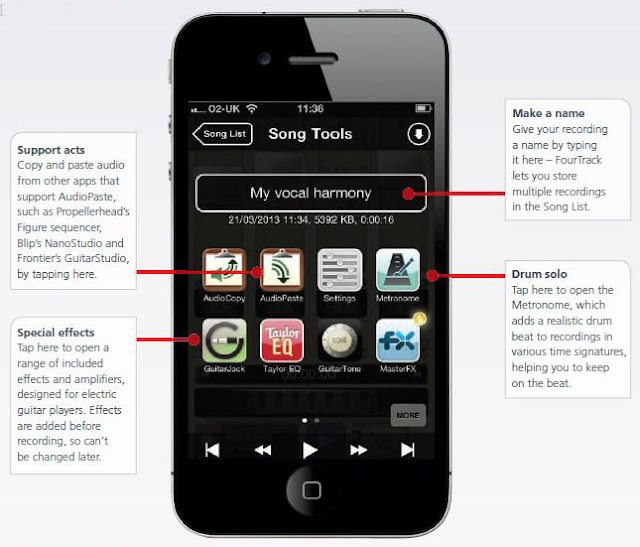 The app comes with a compressor, parametric EQ and amps and effects for electric and acoustic guitarists. There’s even a selection of drums patterns to help keep you in time. FourTrack works best with an external mic, but is a brilliant modern take on the portastudio. 1) Getting started: Download FourTrack from the App Store and tap the icon to begin. For anyone used to conventional digital recording where tracks are arranged like swimming pool lanes, this will be a shock. There are four tracks, each with a volume slider and pan wheel, and a Rec Arm button that readies the track for recording. 2) The first track: Tap the Rec Arm button at the foot of the first track. When you do, the big grey button at the bottom left of the screen will turn red. Slide it to the right and then start recording your first track. As you do, watch the LED meter to make sure that the volume does not stray up into the red and distort the recording. 3) Listening back: When you’re finished, FourTrack will rewind and arm the next track ready for recording. Alternatively, tap play to listen to the track you have just recorded, and if it’s okay, arm the next track manually and record that – as you do, the first track will play back at the same time. Here we’re playing back all four tracks. 4) Accessing song tools: Re-record any tracks you’re not happy with, either completely or by dragging the horizontal scroll wheel left or right to the point in the recording where you want to fix a mistake; as with real portastudios, this is an imperfect science. When you have finished, tap the Song Tools button and type in a name for the recording. 5) Bouncing tracks: Swipe the Song Tools screen to the left to reveal the editing screen. We’re going to ‘bounce’ our four tracks down to two. Tap Bounce and then tap To this Song. This will mix all four tracks and record them on to tracks one and two, then pan them left and right. You can now record on tracks three and four again. 6) Mixing the song: Return to Song Tools, tap Mixdown and then Mix this Song. FourTrack will mix your recording down to a stereo WAV file. At the next screen, tap the Wifi Sync button and follow the instructions to connect to a computer. After a moment, the song will appear on the computer screen. Click the Mix button to open it in iTunes.